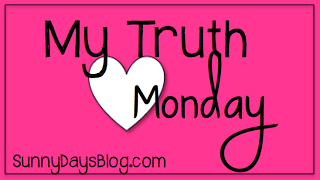 My Truth Thursday - HAPPINESS IS WATERMELON SHAPED! I've been wanting to link up with Denise at Sunny Days for her My Truth Monday since Monday, but I guess I'm running a little late - yet again. I student taught when I was 38 years old so it took me a while to actually achieve my dream of becoming a teacher. I used to say that I was an "older new teacher." Now I still feel like a new teacher because I'm still learning and trying to be a better teacher every day. That's the best part of being a teacher - you're always learning and improving. Every day is a new opportunity to help kids learn and grow. I am so lucky to be a teacher because I truly love my job and my students. So cute! I used to play teacher too. But I liked to be the math teacher with my sister(I even had a teacher's copy of the math book, so I could "check" her answers).